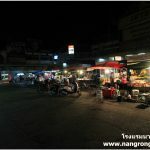 Near Nangrong Hotel, Budget and Boutique Hotel just walk only 50 steps. 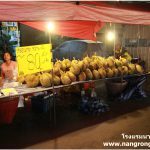 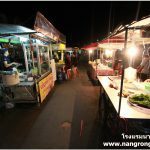 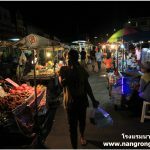 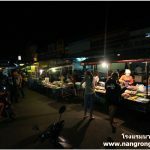 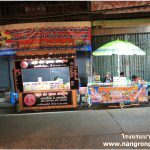 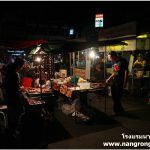 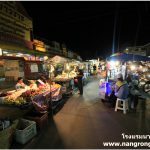 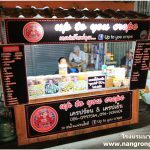 Nangrong Night Bazaar or Nangrong Night Plaza or Nangrong Night Market is very near Nangrong Hotel, Budget and Boutique Hotel, just walk only 50 steps. 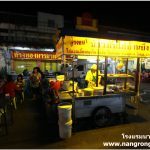 There are the center of local food, local products, organic vegetables of villagers, and dinner of many food shops such as Buriram meatball, delicious meatball shops, food stall (a la carte ), Thai Sausages, Delicious Hainanese chicken rice ( Steamed Chicken with rice ), Barbecued red pork in sauce with rice, many kind of Spicy Salad, Nangrong pork snack, grilled Chicken, noodle and Stewed pork soup shop, Rice noodle soup with Stewed pork,Spicy pork noodle soup with lemongrass, chilly pasted and lime juice, Thai fried noodle withfried mussel, Chinese Bun, Seasonal Fruits, and a lot of dessert such as Water Chestnuts in Coconut Milk ( Tabtim Krob ), Dumplings in Coconut Cream ( Bua Loi ), and various kind of Thai dessert. 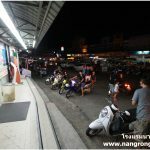 Moreover, There is also 7-11 convenient store which is opposite to Night Bazaar. 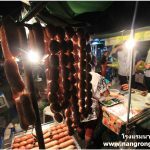 You can chose whatever you want here.